Legumain, with active site cysteine in yellow, histidine and asparagine in orange, and glycosylation in magenta. Legumain has been given many names, reflecting its many different functions. In plants, it helps to process proteins in storage vacuoles, so it has been called vacuolar processing enzyme. In our cells, it processes proteins for the immune system, generating the short peptides displayed by MHC, and has been called asparaginyl endopeptidase (based on its preference for cleaving proteins after asparagine). It also acts as an enzyme that chews off amino acids at the end of protein chains, and was given another name for that function. Fortunately, the research world has settled down to the simpler name “legumain” to refer to the enzyme that performs all of these jobs. Legumain (shown here from PDB entry 4awb) uses a cysteine amino acid to perform its protein-cutting reaction, assisted by a histidine and an asparagine. However, these three amino acids are arranged differently than the familiar catalytic triad seen in serine proteases. In serine proteases, all three are arranged in a line on one side of the target protein chain, and in legumain, the cysteine and the histidine/asparagine attack the chain from opposite sides. 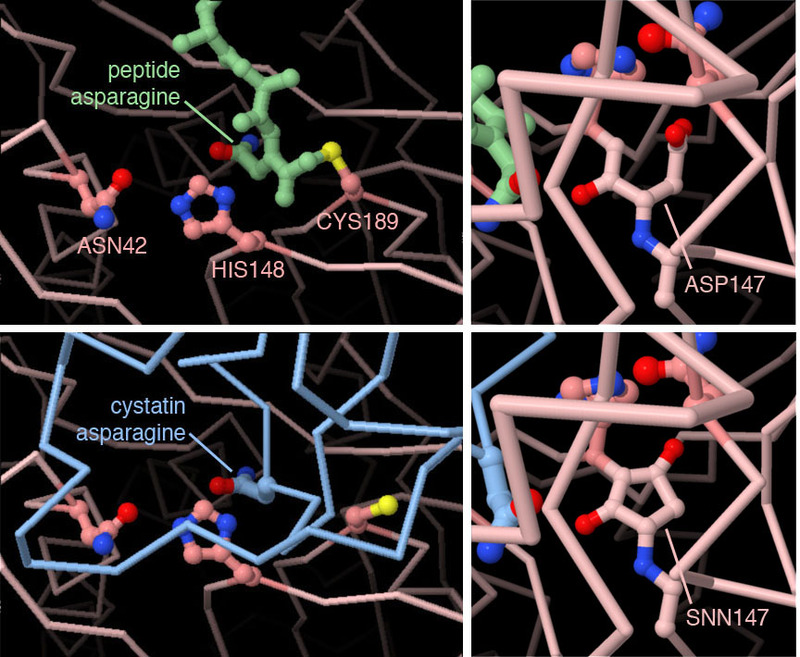 Caspases have a similar arrangement of catalytic amino acids, but the cysteine protease papain has an arrangement more like the serine proteases. Legumain also has a small specificity pocket with two negatively-charged amino acids and two positively-charged amino acids. These amino acids recognize an asparagine sidechain in the target protein, ensuring that legumain only cuts in the proper place. Surprisingly, further study of legumain revealed that it is also quite adept at reconnecting protein chains. For example, it is involved in the circular permutation of concanavalin A, and also assists with building of cyclic peptides that are used by plants for defense. This ligation reaction occurs in the same active site, but doesn’t appear to use the cysteine amino acid. Instead, a nearby aspartate adopts an unusual chemical form (shown in the JSmol) and is thought to assist with the reaction. 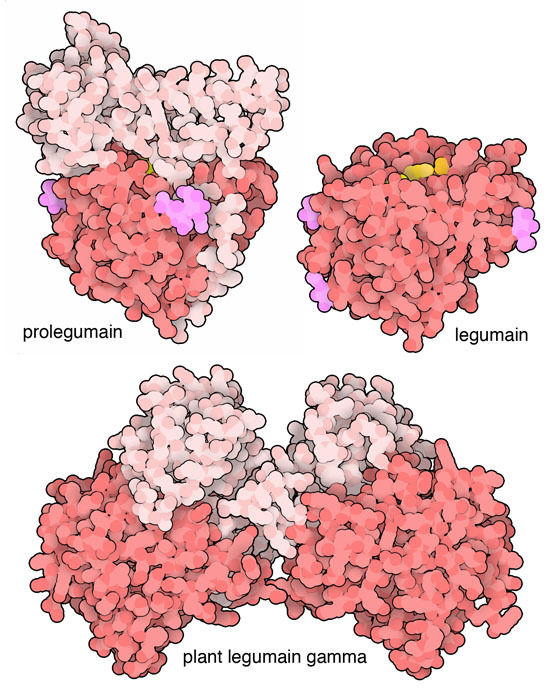 Inactive proenzyme of human legumain (top left), active human legumain (top right), and a cleaved but still inactive form of a plant legumain (bottom). Proteases can be dangerous to the cell if not properly controlled. 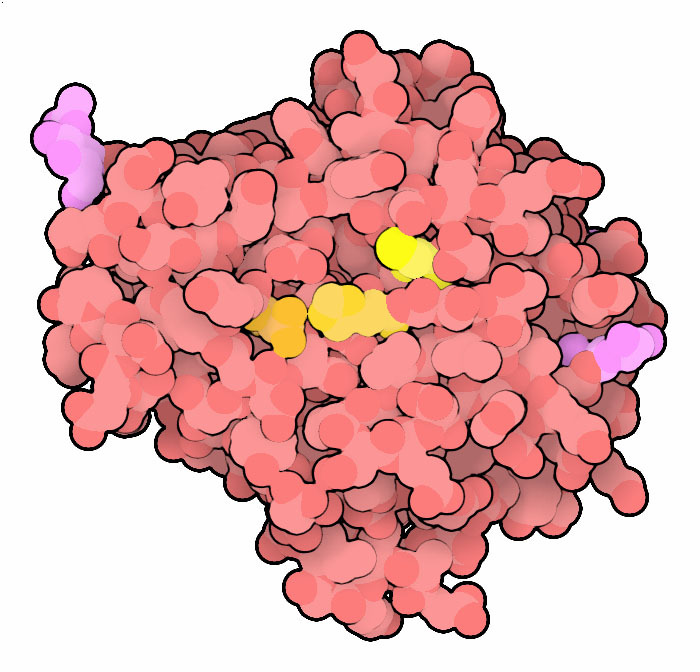 Legumain is produced by ribosomes as an inactive proenzyme (PDB entry 4fgu), with a long inhibitory portion that blocks the active site. Legumain typically performs its function in vacuoles or endosomes, where other protein-cutting enzymes clip off the extra portion to activate it. One type of plant legumain (PDB entry 5nij) adds an extra step to this maturation process: the cleaved version stays together, and then further assembles into dimers and larger aggregates, which are stored in the endoplasmic reticulum until they are needed. PDB entry 4awb captures legumain in the middle of its reaction. At top left, a short peptide has been cleaved and half is left attached to the catalytic cysteine. Later, a water molecule will be used to release the attached peptide. PDB entry 4n6o shows legumain bound to the inhibitory protein cystatin. As seen at bottom left, it also has an asparagine that fits into the specificity pocket, but it is cleaved very slowly, and when cleaved, it is also reconnected by legumain. The images on the right show an aspartate that adopts an unusual aminosuccinimide form that is thought to be important in the ligation reaction. Click on the image to explore the structure, and display the amino acids in the specificity pocket and the modified aspartate. Try comparing the structures of legumain (4awb) and caspase 1 (2hbq). Several other proteins have the unusual aminosuccinimide form of aspartate. You can find a listing of examples at the Ligand Depot page for SNN. 5nij: Zauner, F.B., Dall, E., Regl, C., Grassi, L., Huber, C.G., Cabrele, C., Brandstetter, H. (2018) Crystal structure of plant legumain reveals a unique two-chain state with pH-dependent activity regulation. Plant Cell 30: 686-699. Dall, E., Brandstetter, H. (2016) Structure and function of legumain in health and disease. Biochimie 122: 126-150. 4n6o: Dall, E., Fegg, J.C., Briza, P., Brandstetter, H. (2015) Structure and mechanism of an aspartimide-dependent Peptide ligase in human legumain. Angew. Chem. Int. Ed. Engl. 54: 2917-2921. 4awb, 4fgu: Dall, E., Brandstetter, H. (2013) Mechanistic and structural studies on legumain explain its zymogenicity, distinct activation pathways, and regulation. Proc. Natl. Acad. Sci. USA 110: 10940-10945.